the regina mom‘s adopted MP, Niki Ashton, speaks what the regina mom‘s Conservative MP will not. NDP ‘extremely concerned’ Kenney supports ‘abortion’ debate | CTV News. Suggesting that the ruling Conservatives have used private member’s bills to propel their party’s agenda in the past, Ashton suggested Woodworth’s motion should never have gotten this far. Ashton said the fact it has, indicates the ruling Conservatives aren’t as averse to the debate as they’ve suggested. UPDATE: LeadNow.ca is raising immediate funds to place an ad in Wednesday’s Ottawa Citizen. Please contribute if you are able! With this post, the regina mom publicly declares her support for Dr. Ryan Meili in his bid for Leader of the New Democratic Party in Saskatchewan. Learning about his community-based perspective, commitment to progressive ideals and dedication to building a better world pretty much cinched the deal. Dr. Meili truly cares about people. His practice sees him working as a family physician at the West Side Community Clinic in Saskatoon or spelling off doctors in rural Saskatchewan communities or working with University of Saskatchewan medical students in the Making the Links Training for Health Renewal program at the Massinga Training Centre in Massinga, Mozambique, communities in northern Saskatchewan and in the heart of Saskatoon at SWITCH, the Student Wellness Initiative Toward Community Health, a student-run, interdisciplinary, inner-city clinic. the regina mom really likes that the good doctor walks the talk. And the talk Ryan Meili walks appears in his book, A Healthy Society: How a focus on health can revive Canadian democracy (Purich 2012). Needless to say, A Healthy Society is now on trm‘s reading list. Oh yes, dear Reader, you know the regina mom has a soft spot for politics and also for writers. Her experience marketing this hot place taught her that spending time visiting libraries and bookstores, town halls and community centres throughout the province and the country, sharing a book to which you’ve given your creative energies, takes a lot of courage and confidence, flexibility and commitment. the regina mom wants those characteristics in the Leader of the NDP, the party that most closely represents her politics. It’s clear Ryan has those skills and that he will use them to rebuild the NDP in the province and in so doing, build a healthier society in Saskatchewan an Canada. How can she — or you — not sign on for that? The time is right for positive politics! For a number of reasons, the regina mom has had an almost 20-year love/hate relationship with the Saskatchewan NDP. Today, it seems, she is making her way to the love side. Check it out! Donate your Facebook cover image to Ryan’s campaign for the day or the whole campaign! 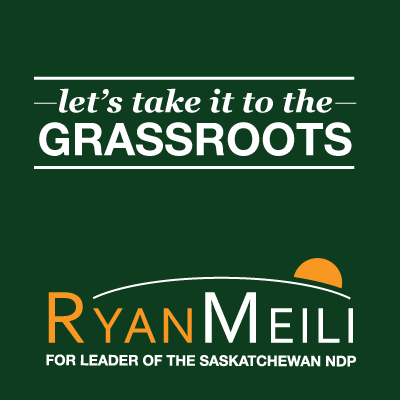 Dr. Meili has scheduled an announcement regarding the Sask NDP’s Leadership race for 12 noon today. It looks like he’s in! He surprised a lot of folks last time around by taking 45% of the final vote. Here’s hoping he takes it this time, because it’s true, we are BETTER TOGETHER! 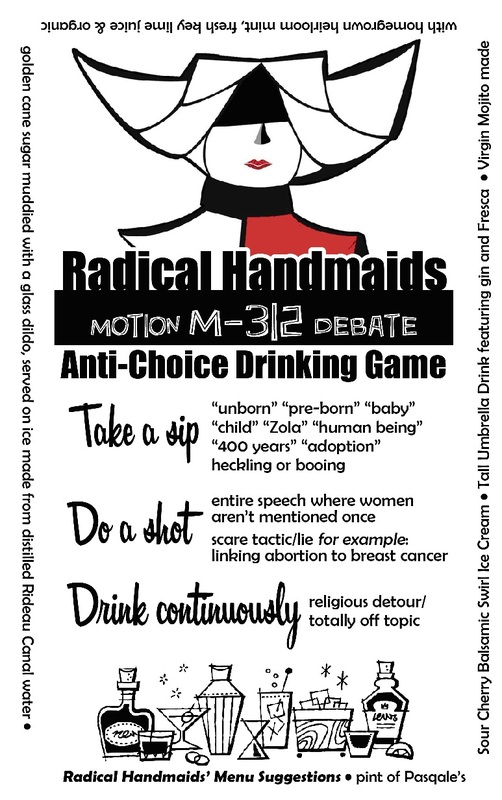 These Radical Handmaids are brilliant, I tell you! We can now organize M312 Debate-Watching Parties across the country! Perhaps URcomm attempted cutesy-fartsiness when it posted this video as a news story on the front page of the University of Regina’s website. the regina mom thinks it’s kinda hurtin’ to see that there, especially when there are hard times at the U of R. An Academic Program Review that was done cheaply and poorly, rejigging by the Administration and reduced funding from the right wing Wall government have forced cuts across the board within the institution (even though The Premier Himself says the province’s economy is booming). However, certain faculties at the U of R will face deeper cuts to their budgets because the research dollars they bring in are lower than those of other faculties. It seems, then, that Arts, Fine Arts and the Humanities faculties — the fundamental pieces of any university education — are under attack. And the regina mom finds that to be very sad, especially because the U of R was once regarded as one of the most progressive institutions in the country. It strikes the regina mom rather hard right now because she’s been hearing from her daughter, a student at the University of Ottawa, about the Orientation Week activities on that campus. In particular, the regina mom is excited about the Alt101 activities, offering up something a little more real to students. No doubt, student groups at the U of R are doing their best to be real with new students, too. With an administration that treats new students to meaningless tripe such as the video above, it’s not gonna be hard. Check out the Facebook page, Community Support for U of R Arts, Fine Arts & Humanities Programs, for the story as it unfolds. The following piece appeared in the May/June 2007 issue of Canadian Dimension magazine. Sadly, the situation for women and unpaid work has become worse, not better. Right wing governments in Saskatchewan and Canada continue to dump unpaid work on communities and families and women in an attempt to rationalize cuts on social spending. A discussion about labour is incomplete without some acknowledgment of the unpaid work performed by women. The traditional work women do, the three Cs – cooking, cleaning, caring – continue to be largely ignored thanks to long-standing sexist definitions of work. It’s almost as though the work women do to keep families healthy and functional, to move the economy through its cycles, and to make the world a somewhat caring and nurturing place really doesn’t matter. Capital, after more than three centuries of greed continues to pressure governments to create conditions for increased profitmaking, conditions which do not benefit women and which increase women’s unpaid work. Even the small gains of recent years are under constant attack by both capital and governments. Women’s groups know that if women are to reach a point of equality with men in this country, or anywhere in the world for that matter, then women’s unpaid work must be honoured in very real ways. Women carry on. Societal definitions of paid work are based on sexist definitions established centuries ago. When our monetary system developed women were chattel; the work women performed preparing meals, cleaning homes, and raising children was not remunerated. As a result, it was excluded from economic records and, as the economic system developed, their work continued — and continues — to be excluded. The economic value of the unpaid work women do is huge and must be acknowledged. According to Manitoba’s United Nations Platform for Action Committee (UNPAC) Canadian women’s unpaid work is an amount equivalent to as much as 41% of Canada’s Gross Domestic Product. The time women spend doing voluntary/community labour and household labour in Canada, according to a pilot study in Nova Scotia, is the equivalent of 571,000 full-year, full-time jobs. Even Statistics Canada (StatsCan) suggests a number anywhere from $234 to $374 billion worth of unpaid work is performed by women each year. Globally, the amount skyrockets to 11 trillion dollars, just a fraction more than what we know the US has spent on its illegal invasion of Iraq. Decades of research and lobbying by women’s equality-seeking groups and others has had minimal impact. Governments are loathe to address the issue. Only recently did StatsCan begin gathering information about women’s unpaid work and that gathering is not thorough. The research documents only three areas of unpaid work: housework, childcare, and senior care. The time women spend building their communities — serving meals at a fowl supper, serving as a board member at the childcare centre, or volunteering at the women’s shelter — is not included in the numbers. Still, all is not lost. Researchers have developed ways to use the data that is gathered to make points about what is not. The gaps and absenses have proven useful in critiquing policy and for envisioning new policies. It is global capital that benefits from women’s unpaid work. As capital seeks increased profits, governments increasingly bend to the corporate lobby, adhering to neo-liberal and neo-conservative economic policies, downsizing or privatizing programs that seek to re-dress imbalances. Women bear the brunt of this greed. Gordon Campbell’s Liberal government, when it took power in BC, almost immediately dismantled one of the most progressive elements of the its provincial government, the Women’s Department. What little remained of it was rolled into the Community Services Department. In effect, all funding to all of B.C.’s women’s shelters ceased and the amount unpaid work by women as well as the incidents of poverty among women increased. In Saskatchewan, Calvert’s NDP government almost annihilated the Women’s Secretariat in its purge of policy analysts a few years ago. An immediate public outcry from Saskatchewan women forced the creation of a Status of Women Office (SWO). It was placed within the Department of Labour which, according to the Assistant Deputy Minister at the time, was “completely unable to absorb” it. The strategy moved many feminist researchers and analysts out of policy areas and, in some cases, out of government completely which could be part of a ploy to remove the last of Keynesian analysis from the bureaucracy. Indeed, in January 2007 the Saskatchewan government received great praise and front page headlines courtesy the Fraser Institute for completely reversing 50 years of economic policy. Apparently, it doesn’t matter that programs to enhance the lives of women in Saskatchewan ended or that the province’s child poverty rate is among the highest in the country. Similarly, Status of Women Canada (SWC), recently attacked by the New Conservative Government of Canada impacts women’s unpaid work. The job cuts, funding restrictions, and removal of the word equality from funding guidelines will mean that research work formerly conducted by paid staff within SWC and within SWC-funded organizations will either not be conducted or will be done by volunteers. Without the research and lobbying the door is open for global capital to gain more ground. It’s as though governments of the day believe that cutting funding and support makes the need for the service nonexistent. But smaller communities of people – women – fill the gaps.. The obvious economic impact on women – the continued cycle of poverty – is compounded by psycho-social implications on women and their children which result in chronic illness, early death, poor children, poor school performance. That means higher societal costs for healthcare. The National Crime Prevention Council of Canada suggests that poor school performance is the “best and most stable predictor of adult involvement in criminal activity.” And that means higher educational and criminal justice costs. All the attacks on women’s lives and the double-duty days haven’t stopped women from organizing for change. Over the past decade or more, women’s response has been building locally and globally. Organizations such as UNPAC, the Feminist Alliance For International Action (FAFIA) and the Global Women’s Strike (GWS) have come into being to demand accountability from the governments on the commitments made to women under international human rights treaties and agreements, including the Beijing Platform for Action (PFA) and the United Nations Convention on the Elimination of All Forms of Discrimination Against Women (CEDAW). The World Women’s March in 2000 brought forth The Feminist Dozen, 13 items that the federal government must address to reduce women’s poverty in this country. Restore federal funding to health care and enforce the rules against the privatization of our health care system, beginning with Alberta. Spend an additional 1% of the budget on social housing. Set up the promised national child-care fund, starting with an immediate contribution of $2 billion. Increase Old Age Security payments to provide older women with a decent standard of living. Use the surplus from the Employment Insurance Fund to increase benefits, provide longer payment periods and improve access, as well as improve maternity and family benefits. Fund consultations with a wide range of women’s equality-seeking organizations prior to all legislative reform of relevance to women’s security and equality rights, beginning with the Criminal Code and ensure access for women from marginalized communities. Implement a progressive immigration reform to provide domestic workers with full immigration status on arrival, abolish the “head tax” on all immigrants and include persecution on the basis of gender and sexual orientation as grounds for claiming refugee status. Adopt national standards which guarantee the right to welfare for everyone in need and ban workfare. Recognize the ongoing exclusion of women with disabilities from economic, political and social life and take the essential first step of ensuring and funding full access for women with disabilities to all consultations on issues of relevance to women. Establish a national system of grants based on need, not merit, to enable access to post-secondary education and reduce student debt. Adopt proactive pay equity legislation. To date, not one of the recommendations has been fully implemented. Nearly 1.2 billion hours of women’s time each year is spent on fundamental work that goes unnoticed, unrecognized, and undervalued, thanks to archaic definitions of paid work. Public programs and services that seek to redress imbalances are under constant attack by global capital. Programs that support necessary public services for women and children are dismantled, never to appear again, or reappear as watered-down versions of what they once were. Women work harder and suffer greater hardships as a result. Still, women carry on with their work and with resisting oppression. Only constant and continued pressure from all sectors of society will ensure equity is reached.